Students seem to understand that narratives warrant rich, vivid, sensory language. Likewise, students recognize the argumentative nature of opinion writing and associate that with strong details and illustrative examples. When it comes to informative/ explanatory writing, students suddenly seem compelled to write in a sterile fashion. For some reason, the shift to informational writing results in papers filled with lots of sentences that sound like they have been ripped from a manual or dictionary. 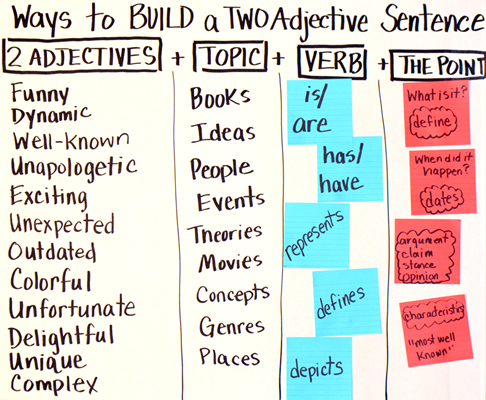 This chart, created with fifth graders, is designed to help students vary their sentence style when writing explanatory essays. This can be used to improve the sentence fluency with all types of writing, but seems most needed with informational text. Next, I asked students to share some things that we write about when we tackle informational writing. I add these ideas under topics. Note that the standard calls this informative/explanatory writing. I deliberately use these interchangeably, but often use the term informational text as well. Adjust your language based on your school requirements and preferences. Then, I add the headings to the other columns and, again, call on students to help list verbs, points, and possible adjectives. None of these lists are meant to be exhaustive and are just representative of what we came up with that day. After the chart was completed, I asked students to name a book. Once they named the book, I followed the formula to create a sentence. We continued down the list, naming different topics and writing sentences to match the pattern. As we moved on, students took more ownership of the examples. Smart and savvy, Bill Gates is one of the world’s wealthiest men. Popular and crowed, Orlando represents summer for many people. Exciting and unique, The Superman Rollercoaster has long lines every weekend. Controversial and polarizing, the theory of evolution is taught in many schools. Good morning Dr. Roz. Just honed in on your website and I am hooked. You’ve listed some very helpful resources that I definitely plan to incorporate in my classroom. The anchor charts and illustrations are wonderful. My middle schoolers are struggling with citing text evidence and your articles are right on time! Thank you for adding the necessary changes in wording when going from elementary to middle as well. We need you in a PD. Leave a Reply to Pamela Belcher Click here to cancel reply.